The National Institute for Occupational Safety and Health (NIOSH) would like to inform the occupational health community of the possibility of adverse effects to the testes and the hemopoietic (blood forming) system in workers exposed to glycidyl ethers. During development of a NIOSH criteria document on glycidyl ethers, a pattern of research findings emerged which indicates that some of the glycidyl ethers may be capable of producing testicular atrophy and hemopoietic abnormalities in various species of laboratory animals. Additionally, after the issuance of the June 1978 NIOSH criteria document, a 1957 study was released to NIOSH reporting testicular atrophy in laboratory rats exposed to n-butyl glycidyl ether. While none of the individual research reports are conclusive with respect to the ability of glycidyl ethers to produce permanent changes to the testes or hemopoietic system in laboratory animals, some of the changes observed may act as predisposing factor to systemic problems. NIOSH is not aware of any studies investigating the possibility of occurrence of testicular atrophy or hemopoietic abnormalities occurring in humans exposed to glycidyl ethers. The possibility of these effects occurring in humans is reason for concern. Therefore, NIOSH requests that any information regarding testicular atrophy or hemopoietic abnormalities observed in workers exposed to glycidyl ethers be reported to the NIOSH Division of Surveillance, Hazard Evaluations, and Field Studies, Industry-Wide Studies Branch, Medical Section, Telephone: (513) 684-3593. NIOSH advises strict adherence to the detailed recommended occupational standard described in the glycidyl ethers criteria document. Particular attention should be given to appropriate medical surveillance in order to detect testicular atrophy or hemopoietic abnormalities in exposed workers. NIOSH requests that producers, distributors, users, professional associations, and unions transmit this information to their customers, employees, associates and members. Glycidyl ethers are synthetic compounds characterized by the group and find their major use as components of epoxy resin systems. 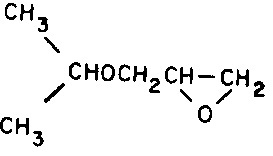 The “diglycidyl ether of bisphenol A” has been a traditional basic active ingredient of epoxy resins; other glycidyl ethers are frequently incorporated into epoxy resin systems as reactive diluents. 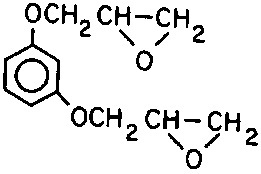 The epoxy group of the glycidyl ethers reacts during the curing process and glycidyl ethers are therefore generally no longer present in completely cured products. Epoxy resins containing glycidyl ethers are used in a variety of applications including protective coatings, reinforced plastics, as well as bonding materials and adhesives. Much occupational exposure to glycidyl ethers results from the use of proprietary or trade name products which do not disclose the presence of toxic agents in their formulations. This complicates efforts to take appropriate precautionary measures for the prevention of occupational disease. For example, unrecognized hazardous situations can occur where protective coatings containing epoxy resins are sprayed, thereby facilitating the inhalation of even non-volatile materials, and where there is skin contact with epoxy resins containing glycidyl ethers. The National Occupational Hazard Survey, conducted between 1972 and 1974, was based on a sample of businesses selected by the Bureau of Labor Statistics and consisted of approximately 5,000 establishments employing nearly 900,000 workers in 67 standard metropolitan areas throughout the United States. This sample was representative of non-agricultural businesses covered under the Occupational Safety and Health Act of 1970. NIOSH is not aware of any studies investigating the possible occurrence of testicular atrophy or hemopoietic abnormalities in humans exposed to glycidyl ethers. However, other effects observed in humans include dermatitis, irritation and allergic reactions. The NIOSH glycidyl ethers criteria document1 provides detailed evaluative review of reported adverse effects resulting from exposure to glycidyl ethers. Studies in several different research laboratories indicate that some of the glycidyl ethers are capable of producing adverse effects to the testes and hemopoietic system in various species of laboratory animals. Reported testicular abnormalities (including testicular atrophy with decreased spermatogenic activity) following exposure to glycidyl ethers are presented in Table 3. Table 4 summarizes reported hemopoietic abnormalities following exposure to glycidyl ethers, including alteration of the leukocyte count, atrophy of lymphoid tissue, and bone marrow cytotoxicity. These abnormalities were usually observed along with pneumonia and/or toxemia, and therefore may be secondary effects. However, especially in light of the generalized reduction in leukocytes and the atrophy of lymphoid tissues, the observed hemopoietic abnormalities may have been predisposing factors to pneumonia. While none of the individual research reports are conclusive with respect to the ability of glycidyl ethers to produce permanent changes to the testes or hemopoietic system in laboratory animals, the pattern of effects displayed in Tables 3 and 4 is reason for concern. The NIOSH glycidyl ethers criteria document1 contains an evaluative review of the literature on effects of exposure to glycidyl ethers. Reported adverse effects in laboratory animals include sensitization, and skin and eye irritation, as well as mutagenic and tumorigenic activity. enlarged myeloid cells in 250 and 500 mg/kg groups. lymphoid atrophy of the thymus at 500 mg/kg. Reports from different laboratories present a pattern of findings indicating that some of the glycidyl ethers may be capable of producing testicular atrophy and hemopoietic abnormalities in various species of laboratory animals. While none of the individual research reports are conclusive with respect to the ability of glycidyl ethers to produce permanent changes to the testes or hemopoietic system in laboratory animals, some of the changes observed may act as predisposing factors to systemic problems. NIOSH is not aware of any studies investigating the possible occurrence of testicular atrophy or hemopoietic abnormalities in humans exposed to glycidyl ethers. The possibility of these effects occurring in humans is reason for concern. Therefore, the occupational health community is advised of the possibility of these effects appearing in workers exposed to glycidyl ethers. The “NIOSH Criteria for a Recommended Standard……Occupational Exposure to Glycidyl Ethers” was transmitted to the Occupational Safety and Health Administration (OSHA), Department of Labor, on June 30, 1978.1 This criteria document contains detailed recommendations regarding maximum exposure levels medical surveillance, labeling and posting, personal protective clothing an equipment, informing employees of hazards, work practices, sanitation, monitoring and recordkeeping requirements as well as sampling and analytical procedures. Existing occupational exposure limits for specific glycidyl ethers are listed in Table 5. NIOSH advises strict adherence to this detailed recommended occupational standard for glycidyl ethers described in the NIOSH criteria document. Particular attention should be given to appropriate medical surveillance in order to detect testicular atrophy or hemopoietic abnormalities in exposed workers. NIOSH requests that any information regarding testicular atrophy or hemopoietic abnormalities in workers exposed to glycidyl ethers be reported to the NIOSH Division of Surveillance, Hazard Evaluations, and Field Studies, Industry-Wide Studies Branch, Medical Section, Telephone: (513) 684-3593. NIOSH Criteria for a Recommended Standard …. Occupational Exposure to Glycidyl Ethers. United States Department of Health, Education, and Welfare. Public Health Service, Center for Disease Control, National Institute for Occupational Safety and Health, Cincinnati (1978), in press. Standard Industrial Classification Manual 1967. Executive Office of the President, Bureau of the Budget, Washington (1967). Kodama, J. K., R. J. Guzman, M. K. Dunlap, G. S. Loquvam, R. Lima and C. H. Hine: Some Effects of Epoxy Compounds on the Blood. Arch. Environ. Health 2: 56-67 1961. Anderson, H. H., C. H. Hine, R. J. Guzman and J. S. Wellington: Chronic Vapor Toxicity of n-Butyl Glycidyl Ether. Confidential Report to Shell Development Company, Emeryville, California from Department of Pharmacology and Experimental Therapeutics, University of California School of Medicine, San Francisco, U. C. Report No. 270, February 4, 1957. Hine, C. H., J. K. Kodama, R. J. Guzman, M. K. Dunlap, K. Lima and G. S. Loquvwam: Effects of Diglycidyl Ether on Blood of Animals. Arch. Environ. Health 2: 37-50 1961. Terrill, J. B. and H. J. Trochimowicz: A Two-Generation Reproduction and Mutagenic Study in Rats. E. I. du Pont de Nemours and Company, Haskel Laboratory for Toxicology and Industrial Medicine, Haskell Laboratory Report No. 163-75, Wilmington, Delaware, April 7, 1975. Shimkin, M. B., J, H. Weisburger, E. K. Weisburger, N. Gubareff and Suntzeff: Bioassay of 29 Alkylating Chemicals by the Pulmonary-Tumo Response in Strain A Mice. J. Nat. Cancer Inst. 36: 915-935 (1966).